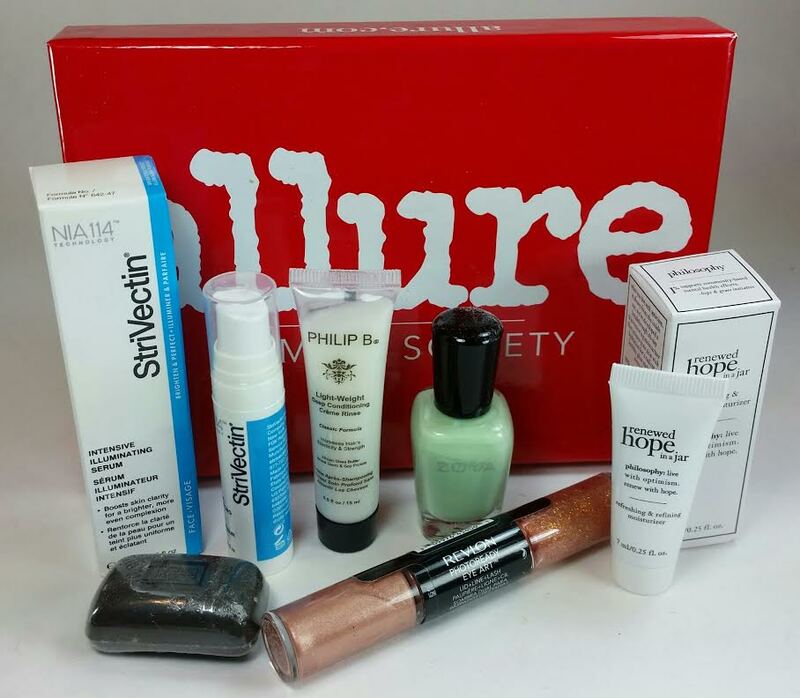 The January 2015 Allure Sample Society box really lived up to all my expectations. Sample Society is one of the boxes I find nearly impossible to give up. I've been subscribed now for one whole year and have been very happy! The first half of last year was very skincare and hair heavy with some makeup. 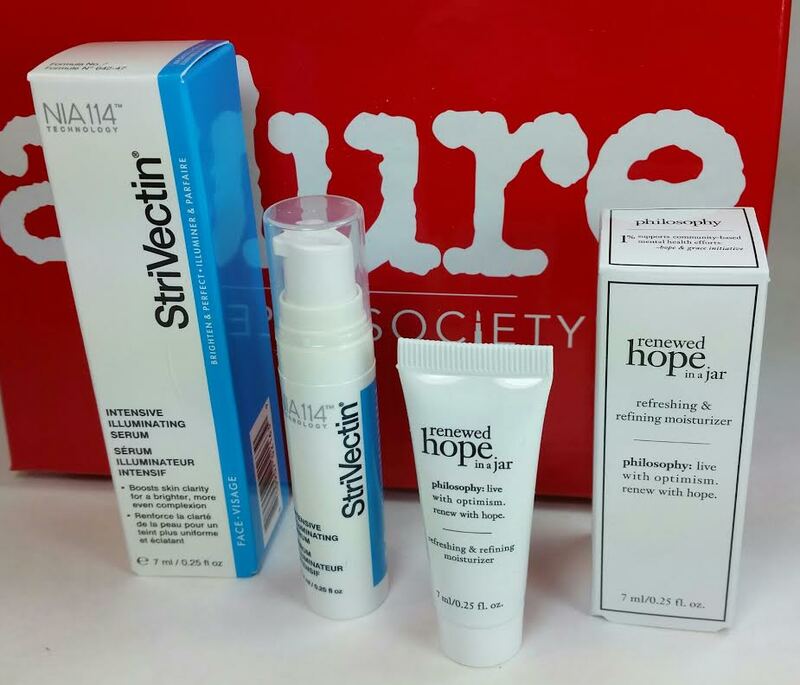 Then in June they did a rebranding to make Allure more prominently associated with the box. It used to be the Beauty Bar Sample Society with Allure but now it's just Allure Sample Society. With the rebranding came some fantastic makeup! Lots of full size products and far more variety than I'd experienced the first half of the year. I had loved Sample Society before but now it was really wowing me! Of course there will be a dud month or maybe two. That's pretty normal for all subscription boxes. For the most part, though, I've been please with what my $15 has snagged me each month. This month had six products with two full sizes. Of course, nail polish does tend to always be a full size version but I still count it. I'm ridiculously pleased to see StriVectin. I love them and Sample Society gets good samples from them. Before the rebranding, they appeared more often and I never complained. Philosophy is always good to get in a box and I'm really excited about the Erno Lazslo black soap. The Cost: $15/month plus tax where applicable. Philip B light-weight Deep Conditioning Rinse- This has popped up in several subscription boxes. I don't love getting hair products but they're unavoidable. This is a nice sized sample and many people have been very happy with this brand. A bit of trivia for you, Philip B. is the uncle of the Lauren B who has nail polishes that have shown up in Glossyboxes. 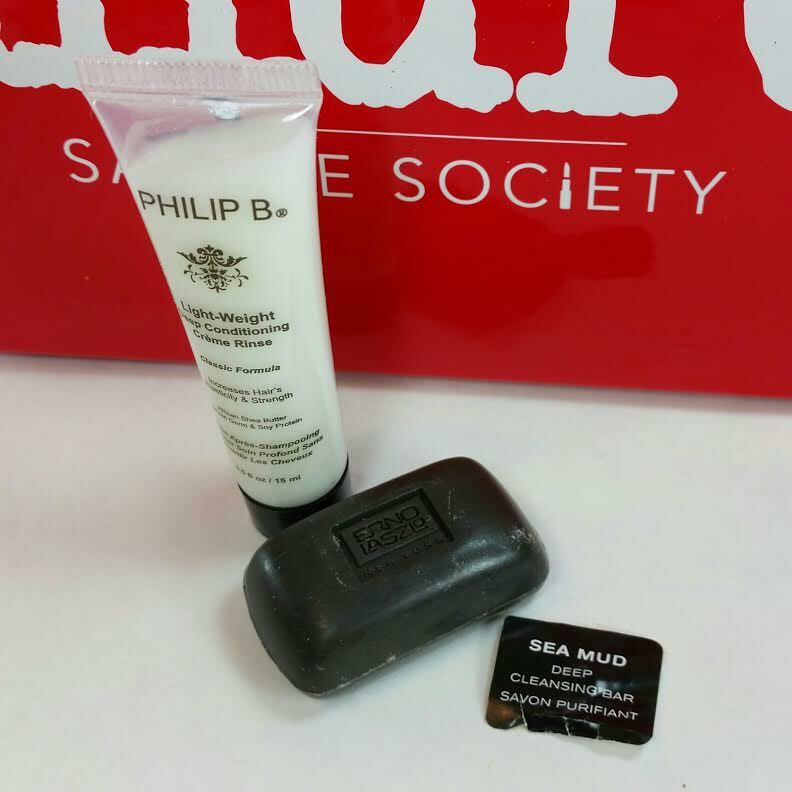 Erno Laszlo Sea Mud Deep Cleansing Bar- I love charcoal soap. I don't know why but something about it really helps keep my skin clean and clear. Clear being the best part, of course. I use an Origins Charcoal Mask and it works wonders. This bar is TINY. It's probably the size of a quarter but when the full size bar is $40, a size like this is worth it. I'll absolutely be using this. Revlon PhotoReady Eye Art in Peach Prism- There were three colors available for this product and I feel that I got the least offensive one. I didn't want the blue or the black and gold. This is a cream eyeshadow and a glitter eyeshadow in one tube. They are applied with a wand. I'm debating this product. I just... I don't know if I'm brave enough for this kind of thing. 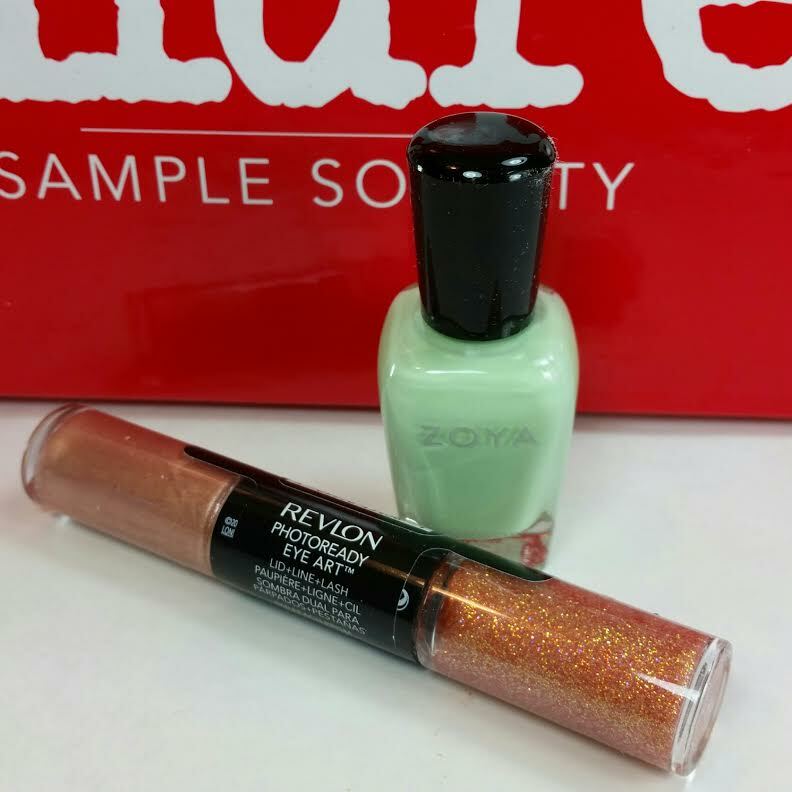 Zoya Nail Polish in Tiana- This isn't my favorite color of all the choices but I like Zoya and I don't mind getting nail polish in the slightest. I like it! It's a minty pastel green and the booklet says that it reminds them of pistachio gelato- it totally does, too. :D The booklet also suggests using a basecoat to prevent streakiness. Makes sense, especially with this pale green. StriVectin Intensive Illuminating Serum- .25oz-It looks like this might have been a last minute addition because it's not in the booklet that comes with the box! That's fine by me because I love StriVectin. Plus I'm really feeling like this is from their new Brighten and Correct line. Is it new? I don't remember seeing it the last time I was on their website. Anyway, this is a lightweight skin brightening treatment that diminishes dull skin, evens skin tone and enhances overall clarity. It's very silky and sinks into my skin fast. However I looked up the ingredients list and I don't really see anything on there that will actually do what they are saying it will. Mainly it's just a moisturizer and it has an acne trigger ( Isopropyl Myristate) in it so don't use it if you've got troubled skin. Philosophy Renewed Hope in a Jar- .25oz- A lightweight, whipped formula that retexturizes your skin with an AHA blend and moisturizes with glycerin. It smells great, not too strong, not too floral or soapish. My skin soaked this up easily and a little goes a long way. I like the AHA in it. It's so good for your skin to get a little renewal and an AHA is the way to go to get some cell turnover going. I'll use this. Or rather, I already did and I will continue to. VERDICT: Another great Sample Society box. The brands included in these boxes make it really hard to quit. It's so cheap and getting things like Philosophy, Laura Mercier, Butter London and StriVectin make this box really hard to resist. I'm not too snooty for Revlon or anything but I really love getting those high end brands. Normally the box has five items but they will occasionally do six. If you would like to sign up for Sample Society, you do that on BeautyBar.com. 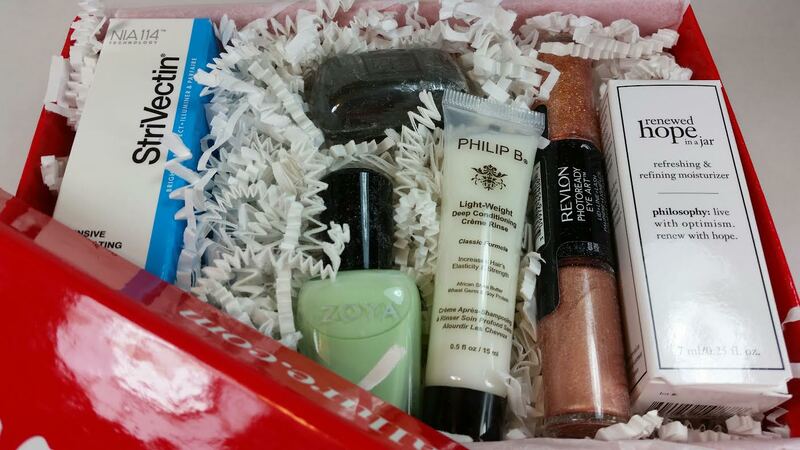 Allure editors choose the items that go in the box but BeautyBar sells the box. Try using code 5FORYOU to get $5 off your first box. The code will only work if you are truly a first time subscriber. I can't test it myself because of that. What did you think of your box? Did you try that Revlon stuff?? What did you think? I like that nail polish color! I'd probably save it for spring though. Yeah, it was an odd color choice for a January box. I tried it and it definitely needs at least two (and three is better) coats. At least it stays chip free for a couple days.